Business houses, big and small have been using marketing activities to build their brand. However, the use of numerous events and mobile and desktop applications have generated the massive amount of data and information. This information is also likely to increase exponentially with time in future. To get a clear customer view to make informed decisions, here we have three ways. Identifying opportunities is important. For this, you need to pull in more relevant data from within as well as external sources about the business and its operations. Once you have this information, the next step is, to conduct the analysis. Big Data and its analytical capabilities help to identify market opportunities and analyze data to boost marketing and sales. Online customers in the market browse the internet using some devices, technologies, and platforms. It is thus important for the business houses to identify and observe the customer’s behavior and derive analytical information. Researchers are making significant efforts in the field of Big Data to see the patterns of their customers. This way, they generate better sales opportunities and higher return on investments for the business. Collecting, processing and managing data can be involved as data are growing at an exponential rate every day. Sales managers and leaders are finding this task daunting as the size of data and information is growing rapidly. To resolve such as issue, companies now need to invest in a concept which is mainly known as algorithmic marketing. 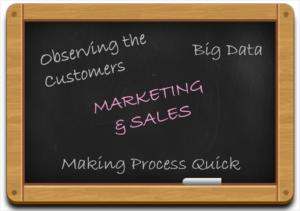 This technique of algorithmic marketing uses big data to make your marketing and sales process simple and more productive. For instance, the method not only tracks keywords but also helps and suggest the ways to replace them. Big Data is thus set to change the Marketing and Sales process making it more automated, quick, and convenient. The technology also helps to predict these processes.